Who do you consider the ultimate news authority? The way the 2016 presidential election has unfolded begs the question. Perhaps the rational answer is that no news outlet should be considered the end-all-be-all when it comes to journalistic clout. Only with a variety of sources and perspectives can you form a well-rounded opinion. Throughout the last sixteen months though, even institutions like The New York Times and Associated Press have made some mistakes in an effort to publish quickly. I’ve called attention to the consequences of a 24-hour news cycle before — it has no doubt changed the way news is produced and consumed. We’re starting to see a shift in journalistic trust that tends more toward the chaotic. Where do you go for news? If you’re a moderately affluent adult in 2016 (children and time travelers can quietly bow out), you probably look online. Twice as many adults use the Internet as read a paper to stay informed. That statistic shouldn’t shock you — this has been a developing trend for a decade. Newspapers are no longer the gatekeepers. Consumers get their news from a wide variety of websites, but how many different sources report news? Aggregating has created a cottage industry of refining and repackaging articles. Everyone is publishing, not necessarily reporting. In a sea of noise, you can always find the note you want to hear. The fractured news market has created echo chambers all over the Internet. However, even across this rugged landscape, one source stands tall, with unparalleled reach. 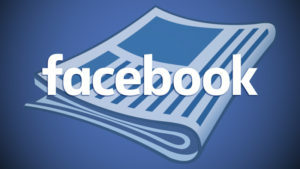 Facebook is used by 64% of American adults, and 30% of American adults get their news from the social networking site. To reference that earlier statistic, 38% of American adults get their news online. That’s an incredible market share. Of the American adults getting their news online, more than 3 out of 4 of them use Facebook. Of course, most people probably use more than one source, and Facebook news is an aggregator after all — directing people to other websites. 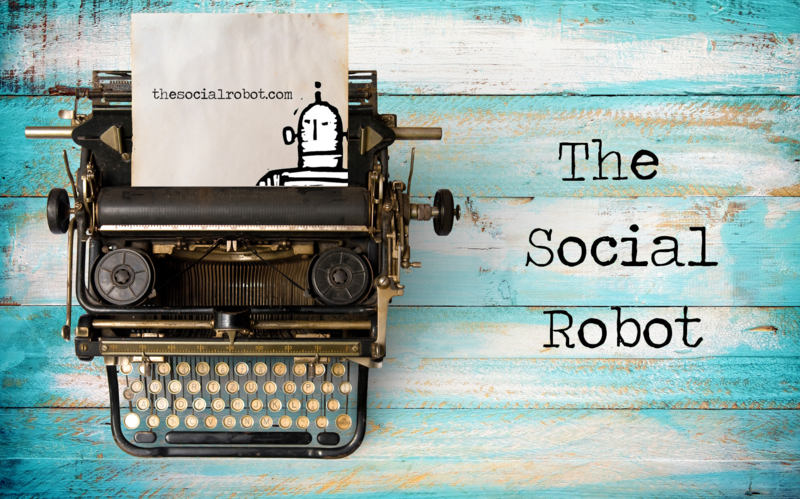 In any case, no one can deny that the social networking site has a massive audience. It’s an influencer. Even if Facebook doesn’t claim to be a journalistic outlet, it has reach. It controls the dissemination of news. That is, in effect, what a contemporary news source does. News sources need journalistic integrity, and that might be even tougher to come by when you start as a for-profit business that later decides to aggregate news. The Facebook news entryway sits on the right-hand side of its page. A little sidebar includes stories that are trending. What used to be three headlines (which were often clickbait riddled), has been reduced simply to three names, of celebrities or institutions, and the number of people talking about the particular issue. You have to click to get any substance. I took this screengrab from my sidebar earlier this week. Notice the discrepancy in the numbers? 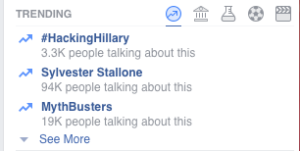 Six times as many people were talking about the super-culturally-relevant-I’m-sure MythBusters story compared to the Hillary Clinton story. Guess what piqued my interest more? But after hovering over the presidential candidate’s name, I saw that the related article was from a far-right news outlet — the chairman of which is also CEO of the opposing campaign. Of Facebook’s millions of users, 3.3 thousand are talking about what is, by definition, a biased news article, and yet that lands on what is essentially Facebook’s front page. This is how trends develop. They’re a snowball careening downhill. Facebook’s got the strength to give stories plenty of momentum at the top — that’s why journalistic integrity is vital, even for aggregators. Repressing news stories is a slippery slope (analogy spinoff). Earlier this spring, former Facebook news curators said they routinely hid Conservative news stories from the view of users. But not all news stories are created equal. Helping to prop up agenda-driven news, makes you complicit in that story. Yes, consumers should be careful about what they read and pay attention to sources, but if news outlets, which Facebook undeniably is, are going to profit from publishing the work of others, they are obligated to retain some journalistic morality themselves.